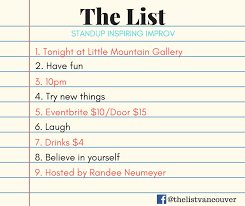 At The List comedians perform never before seen comedic lists, then improvisors take the stage and serve up some hilarious scenes by bringing those lists to life. It’s the show where the audience is always in on the joke. It’s upbeat and silly so come check it out!